LWe were all just living in Alexander Rossi’s world on Sunday, as he won on the streets of Long Beach for the second year in a row. 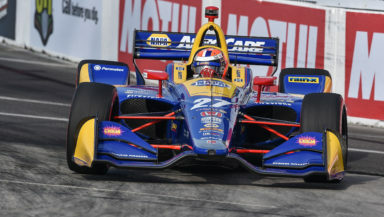 The Andretti Autosport driver dominated from pole position, from the drop of the green flag, as he led all but six laps to win the Acura Grand Prix of Long Beach. His 20.236 second margin of victory is the largest at Long Beach since Al Unser Jr. beat Scott Pruett by 23 in 1995. Even at a track where he’s led nearly 150 laps over the last two years, he didn’t think he’d be this dominant. “We knew it was going to be a really hard fought battle, but the NAPA Auto Parts crew gave me such a great car. It’s his fifth career victory in 54 career starts in the NTT IndyCar Series. He’s the eighth driver to win in back-to-back years at Long Beach. It’s also the 200th victory for Andretti Autosport. Points leader Josef Newgarden finished second, his 25th career podium finish. Following a last-lap blocking penalty assessed to Graham Rahal, Scott Dixon overcame a pit road miscue to round out the podium. Rahal and Ryan Hunter-Reay rounded out the top five. Rahal said the call was “not that tough to swallow,” as he was going to lose the position if he didn’t block, because his used red front tires were all used up. “I had no braking grip whatsoever,” he said. Simon Pagenaud, Will Power, Takumo Sato, James Hinchcliffe and Felix Rosenqvist rounded out the top 10. Despite the last-lap blocking penalty, Rahal earned a top five finish for the second time this season. It ties his best finish of the season. Dixon rebounded from a pit road miscue on his final pit stop, when his team couldn’t get the fuel hose to connect, to salvage a podium finish. After a strong start to the season, including a win at Circuit of the Americas, Colton Herta retired from the race, after suffering damage to his front wing from snapping loose and hitting the wall in Turn 9. He’s finished last in back-to-back races. The only caution of the race flew on the first lap for a three-car incident in Turn 2, that involved Spencer Pigot, Jack Harvey and Marcus Ericsson. Jack Harvey doing some landscaping at the iconic fountain in Long Beach. There was one caution for four laps and five lead changes among three different drivers. Newgarden leaves with a 28-point lead over Rossi, who overtakes Dixon for second in points. IndyCar returns to action on May 11 in the IndyCar Grand Prix at the Indianapolis Motor Speedway, to kick off the Month of May that leads up to the 103rd running of the Indianapolis 500.